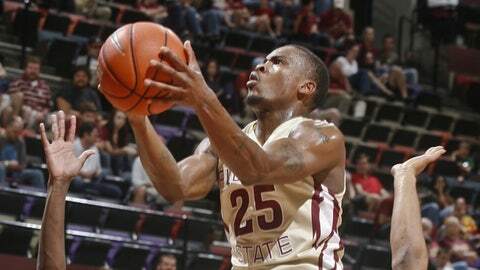 Aaron Thomas scored a career-high 26 points in FSU's win over Charlotte on Tuesday. He's one of six sophomores that have made an impact for the Seminoles (7-3). TALLAHASSEE, Fla. — Florida State’s basketball season has included a stunning upset, but also a few down-to-the-wire misses against top-15 teams. The Seminoles are 7-3 but are just a few points short of counting wins over Florida and Michigan to the resume. This is the fun and frustration for coach Leonard Hamilton, who each night counts on a sophomore-filled roster to play his brand of defense and also produce points. "I think they’re growing, but I don’t think we’re close to where we think we can be," Hamilton said. "I guess that’s one thing that’s good about this team: I don’t think we’ve come close to reaching our potential." While Hamilton laments the lack of consistency from a team that features six sophomores, seniors Ian Miller and Okaro White are both averaging 14 points per game and have provided stability. Florida State stunned VCU on Nov. 21 at the Puerto Rico Tip-Off, routing the nation’s No. 10 team 85-67 in a complete performance from start to finish. The victory gave Florida State needed confidence but also a signature win that strengthens the Seminoles’ resume when the NCAA Selection Committee debates the worthiness of tournament teams in March. "We’re heading in the right direction," Miller said. "But I don’t think we’ve reached our potential yet. We’re still a young team, we’re still learning. And Florida State has also gone 4-0 at home, including a 106-62 thrashing of Charlotte on Tuesday. The Seminoles surpassed the 100-point mark for the first time since December 2005. Next up is another Top-25 matchup, this time against No. 20 UMass (10-0) on Saturday at 2 p.m. in the Orange Bowl Classic at Sunrise. Florida State has found success this season with athleticism, improved defense and depth provided by the group of six sophomores. Four different players have led the team in scoring. On Tuesday, it was sophomore guard Aaron Thomas, who shot 10 of 14 from the floor and scored a career-high 26 points. Two sophomore centers, Boris Bojanovsky and Michael Ojo, have shown significant improvement. Bojanovsky is averaging 7 points per game, but he made 18 consecutive shots over the span of four games until he missed on Tuesday (Bojanovsky scored 11 points on 5 of 6 shooting vs. Charlotte). Ojo is still a project on the offensive end, but at 7-foot and nearly 300 pounds he is a defensive presence. And three sophomore guards — Thomas, Devon Bookert and Montay Brandon — have also seen increased playing time. Thomas is averaging 11.8 points, Brandon is at 10 points and Bookert has caught defenses napping with his precision passing in transition or the half-court offense. "I think we have made a lot of progress from last year," Thomas said. "Guys really didn’t understand the importance of the little things that matters, not just in the ACC but in college. This year, guys’ confidence has grown. We’re able to contribute." Hamilton has one of the best poker faces in college basketball. After games, it’s tough to tell if Florida State has won or lost. Or if the Seminoles won by 44, like they did on Tuesday. Or dropped a tight game. He’s far from content with this team. But he sees the growth and progress from Florida State and is looking forward to another challenge against a ranked team. "We need to win games while we’re growing and that’s the challenge."